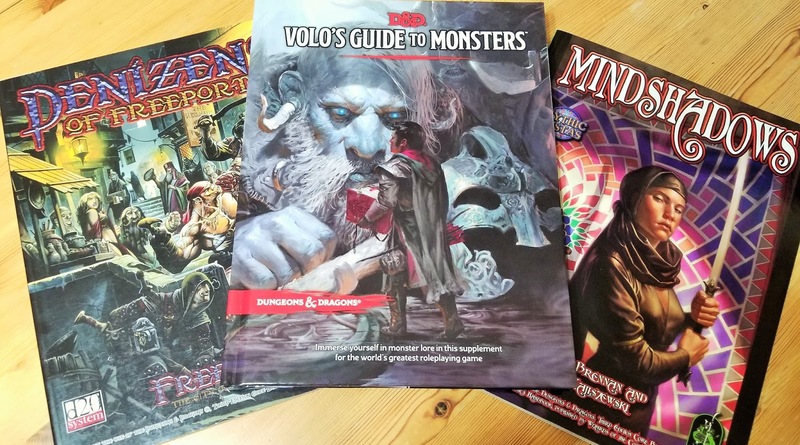 I received both Volo's Guide to Monsters and Xanathar's Guide to Everything as gifts this Yuleltide season, so as I digest them, I'll be sharing my thoughts on how to use them in D&D 5E games set in Freeport: The City of Adventure. Discussing Xanathar's Guide will involve a revisiting of much of the material that I reviewed in my "Unearthed Arcana and Freeport" columns, so doing it justice may require more than one column. For that reason, and because Volo's is the earlier release, I'll start with the Guide to Monsters. The first half of the book is devoted to in-depth background information about nine monsters (or closely-related families of monsters) that are iconic to D&D: beholders, giants, gnolls, goblinoids, hags, kobolds, mind flayers, orcs, and yuan-ti. True giants are rarely if ever encountered in the Serpent's Teeth, and only the amphibious storm giants would be remotely at home in such a location. Campaigns involving visits to the Continent, or to other lands across the sea, could make use of this material. Encounters with gnolls would be similarly limited (though they can at least fit on ships more easily). The distant land of Hamunaptra (from Egyptian Adventures: Hamunaptra) has a variant race of gnoll that was created by Anubis rather than Yeenoghu, and bears little resemblance to them as a result. All three goblinoid races can be found in Freeport, though only hobgoblins have any real status in the city. Goblins and hobgoblins are restricted to Bloodsalt, where they are policed by the Redblades (who have a military culture similar to that described in Volo's Guide to Monsters, albeit one even more hostile to non-hobgoblins). Bugbears presumably are as well, but are more skilled at keeping out of sight, and sometimes serve as hired muscle on ships crewed solely by monstrous races. Hags never appear openly in Freeport, but have been known to inhabit islands within easy sail of the city. Like goblinoids, kobolds are known to dwell in the city's slums. It's possible that they may have been imported to dig (or expand) Freeport's extensive sewer system at some point in the city's history, much as orcs were recruited to build the Lighthouse in more recent years. If so, then the majority of kobolds in Freeport would dwell below its streets by preference, despite the dangers of vermin, serpent people, and worse Down Below. In the World of Freeport, most orcs worship only one god, Krom, who is largely indifferent to their prayers. (This god is borrowed from Green Ronin's Ork! RPG. Black Sails Over Freeport gives some suggestions for using Krom in Freeport.) Krom does not usually have priests, but the Blade of Ilneval and Red Fang of Shargaas stat blocks are suitable for skilled orc war leaders and assassins, respectively. The slender middle chapter of the book presents several new races for use as PCs. Some receive a full Player's Handbook-style entry, while the monstrous races discussed in Chapter 1 merely list their racial traits here. As stated in the Freeport Companions, nearly any exotic race can be justified in passing through Freeport. Therefore, all PC races in this chapter are potentially available, if the DM allows. Two of the new races not covered in Chapter 1 are already part of Freeport canon: At least one aasimar is known to live in Freeport, and lizardfolk live on some of the islands within a few days' sail of the Serpent's Teeth (and are occasionally seen among monstrous ships' crews). Firbolgs and goliaths, like the true giants in Chapter 1, would be a rare sight, but not impossible. Alternately, goliaths could be reskinned as a playable half-ogre race, which would be much more common in Freeport. Kenku resemble the tengu of Japanese folklore, so might have their origin in the Eastern Empire mentioned in Buccaneers of Freeport. If so, then an exceptionally self-disciplined kenku might become a monk or even a samurai (a fighter subclass; see Xanathar's Guide to Everything). The race's speech limitations would make playing a spellcaster (such as the wu jen mystic from "Unearthed Arcana") difficult, but some players may enjoy the challenge. Tabaxi likely come from Khaeder or some other tropical land across the sea (such as the Aztec-based Maztica setting from AD&D 2nd Edition). As natives of the Plane of Water, tritons can be encountered in any deep sea in the Material Plane. However, many Freeporters would mistake them for sea elves, or even merfolk. The tritons' highly developed sense of honor and morality would quickly lead to conflict with many of Freeport's unsavory residents, as well as with local authorities and some of the rank and file, live-and-let-live citizenry. See the notes on Chapter 1, above, about races in the Monstrous Adventurers section (bugbear, goblin, hobgoblin, kobold, orc, and yuan-ti pureblood). The second half of the book is taken up by a collection of new monsters. This section includes new variants of the nine types of monster featured in Chapter 1. In addition, dozens of other creatures are updated to the Fifth Edition rules; there are only a handful of creatures, like the grung, that I did not recognize from previous editions of the game. Another handful, such as the girallon and annis hag, have already appeared in published Freeport adventures. This appendix is very slim, containing only the aurochs, cattle, dolphin (a common sight near Freeport! ), and swarm of rot grubs. The kraken priest could be used to represent a leader in Yarash's cult, while a warlock of the Great Old One could be the same for the Brotherhood of the Yellow Sign (see Cults of Freeport). The sea spawn from Chapter 3 also make good minions of Yarash's cult. Watch this space for my upcoming column(s) about Xanathar's Guide to Everything, as well as continuing reviews of "Unearthed Arcana"! The Forge of Fury #2: Bloody Stirges!